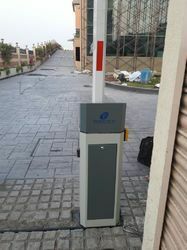 Our product range includes a wide range of automatic boom barrier, automatic boom barrier with long range access control system, automatic barrier, boom barrier, automatic boom barrier with electro hydraulic tyre killer and automatic boom barrier with short range access control system. Maximum Boom Length Up to 6 Mtrs. Size (metre) Upto 6 Mtr. Maximum Boom Length (mm) Upto 6 Mtr. Maintenance-free torque motor ensures 100% duty cycle operation with 5 million MTBF. The heavy duly gear drive motor is environment friendly, energy saving & maintenance free. There is no electric shock or overheating while working continuously, which protects the controller and prolongs its lifetime. Simple structure and double limit switch design ensures easy installation & Maintenance & also reduces maintenance cost. The housing adopts two 2mm precise machining cold-rolled plate & static electricity sprayed anti-UV surface which does not fade over time in. It confirms to IP68 dustproof and waterproof standards. It is simple in design and aesthetically decorates your premises. Fill stainless steel body is available on requirement. The patent pending precise casting sine lever drive mechanism enables the boom arm to move from slow to fast when it starts, and fast to slow when it stops. This effectively reduces the shaking of the boom arm and reduces the burden of the electrical motor. In this way the lifetime of the motor and mechanical components are prolonged. Maximum Boom Length Up to 4 Mtrs. Arm Dimension Upto 6 Mtr. Arm Length (M) Upto 6 Mtr. Boom Length (M) Upto 6 Mtr. Max. Boom Length (m) Upto 6 Mtr. Size 4, 5 & 6 Mtr. Boom Length (M) 4, 5 & 6 Mtr. Boom Length (M) Upto 3 Mrt. Arm Length (M) Upto 3 Mtr. Maintenance-free torque motor ensures 100% duty cycle operation with 5 million MTBF. Theheavy duly gear drive motor is environment friendly, energy saving & maintenance free. There isno electric shock or overheating while working continuously, which protects the controller andprolongs its lifetime. Simple structure and double limit switch design ensures easy installation & Maintenance & alsoreduces maintenance cost. The patent pending precise casting sine lever drive mechanism enables the boom arm to move from slow to fast when it starts, and fast to slow when it stops. This effectively reduces the shaking of the boom arm and reduces the burden of the electrical motor. In this way the lifetime of the motor and mechanicalcomponents are prolonged. Looking for Automatic Boom Barrier ?